Trying out a new challah recipe, and also baking up another “new pareve banana cake,” along with a chocolate-mousse pie (with toasted pecans hidden inside). I hope to also get an apple kugel made at some point in the next – gasp! – hour. Elisheva came out to announce that she’d finished her dvar Torah and wanted to go for a walk. A walk. On a day that is –10 degrees outside at BEST. I was instantly suspicious. A voluntary walk in this weather always means somebody is up to no good: smoking… or something else. So it was Something Else. It was a WiFi connection. She finished her dvar Torah on her iPod Touch and she needed to walk around the neighbourhood until she found an open WiFi connection so she could email it to herself, then come home and print it. Her iPod is a hand-me-down from boy-boy; it used to be broken, like for 6 months, but now it suddenly works again. Anyway, it worked and she stomped back inside 5 minutes later complaining about winter in Canada, and how it was too cold to do any tidying outside. Sheesh. The tidying outside has become a priority because our neighbours (yes, these neighbours) have moved out and are hoping to fix up and sell their house. I know I wouldn’t want to buy a house next to all our driveway junk, so in a fit of niceness in which she gave us two room fans, I promised to tidy the outside, which I’d had in mind anyway after hearing a neighbourhood rumour that they were selling. But apparently, today is too cold to tidy. Oy – I almost forgot: yesterday! I have three precious green Muskoka chairs (in the US they’re called Adirondack chairs) that I have found at various curbs around the neighbourhood, and two are by the side of the house in a nice comfy sitting arrangement. I had some plants there over the summer as well. Anyway, in yesterday’s huge winds, one of my precious chairs blew down to the curb… I noticed it when we got home, but was too busy climbing tables in my suddenly-nice neighbour’s garage fetching room fans to move it. Until… serving milk to the littles for their lunch, I happened to glance outside and noticed the garbage truck at our curb, and the worker TOSSING THE MUSKOKA CHAIR INTO THE TRUCK!!! I dropped the milk (literally, it turned out when I came back inside). And rescued my chair, which is now back in the driveway where it belongs, sensibly weighted down by a heavy plant pot (which will probably crack over the winter because it was left outside, but that is another story for another day). Still a work in progress (UPDATE: see below for finished picture), but I wanted to start introducing weather and days of the week in Hebrew. We’ve been doing them in English since September, and I figure the Hebrew isn’t harder; just different. So I have taken down our trusty Dollarama “weather poster” (as seen in previous posts here and here) and adapted it to its new bilingual life. In addition to wanting Hebrew weather, I have been increasingly disturbed by the fact that this weather chart doesn’t give any indication of how bitterly COLD the weather is outside. Elisheva refused to change it to “Sunny” the other day because she said it didn’t count if it was cold out. Anyway. Overall I think it looks nice, if a little homemade. It is homemade; I will not be ashamed of that! The thermometer is not not finished yet in this picture, in case you’re wondering. I printed paper-doll figures that I hope to have Naomi dress and colour in seasonally appropriate garb, and then I will glue them on, the “summer” one higher and the “winter” one lower on the thermometer I drew on. I will also add the words “kar bachutz” (cold) and “cham bachutz” (hot) to label the appropriate paper doll. They do sell Hebrew days-of-the-week posters. They also sell Hebrew weather posters. But I wanted one that did it all – or almost all… and now this one does! Oh. Speaking of weather… tom0rrow’s expected HIGH: minus 10 degrees. Yes, high. Yes, ten. Okay, that’s Celsius. It’s still bloody cold. UPDATE: Ta-da! The finished poster! p.s. The paper doll cutouts, clothes, etc are free printables at http://www.makingfriends.com/!!! Terrific site! For some reason, Israelis are more likely to call this Tu b’Shvat… the yeshiva world seems to prefer the name “chamisha asar b’Shvat.” No clue why. It wasn’t what I was looking for, but I just stumbled across this terrific “Seven Species” video excerpt, which shows kids interacting with the shivas haminim, the seven special species that grow in eretz Yisrael. The accompanying song is sweet – and a little chassidish – without being utterly cloying. We have been singing the “Shkeydiya Porachat” song for years (anything on an Uncle Moishy album, I can sing, too! ), but this year is FINALLY the one I got my act together to learn the words to the classic Israeli Tu b’Shvat song “Kach Holchim Hashotlim.” Yup, all three verses. Don’t know if I’ll have it memorized, but I don’t trip over it as much. Anyway, one evening last week, I sat with Elisheva peering over my shoulder and we worked out a singable translation which I’m quite proud of. Cindy Paley has one that is simpler, but I think ours preserves the meaning and the rhyme scheme of the original… so there. Naomi loves when I sing Hebrew songs in English, and I think I’m getting better at creating meaningful translations. Though sometimes, it gets a little silly. I am not really an “O” type of person in real life. O really, I’m not! Here they come, o planters here! What brings you, o planters, here? What comes here, o planters, near? What inspired this is that my sister just called and asked what we’re doing for tu b’shvat, which is on Shabbos. Not much, not much at all. The kids gathered a stick from Cedarvale, I stuck it in a blob of air-hardening clay, and we are sporadically gluing green tissue-paper leaves to it when the inclination strikes. Hopefully, we’ll have added a few more, plus some pink “almond blossoms” so it looks less mangy (see top of post) in time for Shabbos. I don’t mean to put this activity down, by the way… it’s super-easy, with fairly rewarding results, if only because of the size of the branch. Cheap and easy, using natural materials: my favourite criteria for a craft! Hey! I just started wondering if it might be possible to force a willow or forsythia in time for tu b’shvat? No reason why not, as far as I can tell. It is too late for this year, but that might make a great “science” project next year, to demonstrate that the trees are not really dead, just sleeping ‘till winter’s over. Let’s just see how much energy I have to put this all together. Maybe a song and a tree is enough for this year. So this thing at shul last night kind of brought out all my insecurities… big time. On the one hand, I was there as a professional, a writer, so that is a great disguise to bring anywhere. Whip out the clipboard, whip out a pen – SuperWriterWoman, at your service! But on the other hand, there I was, trapped in the Mother of all Kiddushes, everybody dressed up super-duper nice. Like, I mean, if I thought everybody normally looks way nicer than me on Shabbos, well… let’s just say a couple of layered cotton shirts was NOT the look everybody else chose to have on. I don’t think there was a female person in the room without spangles. Had this been the 80s, shoulder pads would have been de rigeur. That kind of event. And there I was, trying very hard not to have flour smears all over – tough in a dark skirt! Trying hard to flash the BFS (“big fake smile,” as I whisper to Elisheva over and over at a typical kiddush… she’s worse at this stuff than I am). Trying hard to make smalltalk, but it’s tough when I am the person everybody else can apparently see through to the way-more-interesting-person on the other side of the room. I am the person who, if somebody is waving at me across a table, I look around behind me first to make sure there isn’t somebody better they’re trying to reach. Last night, somebody I wasn’t sure I had ever met before did that. She wouldn’t stop waving. So I looked behind me: nobody. Pointed at myself, quizzically. She nodded. Okay! Flash the BFS, smile, wave back, relieved and baffled, all at once. Yay, she wanted ME! Um, who is she? I sometimes try hard not to think it’s a money thing. But the people with money always seem to be absolutely adorable? And adored by everybody there is to adore them. They have the right clothes, just grab them and go. The right hat or sheitel or whatever, and you can bet it’s all set and they look terrific. But I know it’s not just money, because I have known people of meager circumstances who look simply fabulous. Who you might guess they didn’t have a million bucks, but they have a personality that shines and a million true friends nevertheless. We are the people who, when the rabbi circulates, he says, “hi, guys!” enthusiastically, and moves on fast before he has to come up with specifics. I felt like a ghost for the better part of the evening. I’m usually too scared to connect with somebody more than once, for fear that I have the wrong person. If they’re wearing a different hat or a different outfit, well, let’s just say there are about three hundred really SIMILAR-looking people in our shul. Somebody walked up to me in the hall last night. A person who, like me, was obviously Not Circulating. A person I have seen at least hundreds of times in shul. Everybody was doing a double-take when they saw her, so I guess she was more dressed up than usual. I actually recognized her, but didn’t know her name. Luckily, she introduced herself, by name (oh, what a difference! ), and said, “I’m the one who sent that email.” She did, a couple of weeks ago, sent an email to a bunch of people to remind me of something important that we’d all apparently been careless about remembering. Because I was so scared as I said it. What if it was a different email? What if she’d emailed about some stupid board meeting or a kids’ program or something completely else? Still, I figured “glad” was tame enough, just in case I was wrong: who wouldn’t be glad to be reminded about a board meeting? And she took a breath and explained why she’d sent the email – like I said, it was something important that we both apparently care greatly about. And we had a fairly nice (for me) little conversation before her husband came along to rescue her from the layered-cotton-shirt drabling in the hallway (that would be me). Yes, that was a leap, and I took a few more. One person told me his last name and I mentioned that I’d taught his mother at the Betel Centre. It could have been someone else, but I was right, it was the right person and that is how you make conversation. What would happen if I was wrong? What if I jumped in and actually made a mistake? The world would end, that’s all. I would shrivel up and die of embarrassment, like salt on a slug. Dumb. Of course, it wasn’t him. Nobody heard me or saw me, that I know of. The person who might have been my zeidy was too far away to notice the manic skinny flailing green child rushing at him with such enthusiasm. Did I mention that I was a skinny, flailing, gawky green person for the first twelve years of my life? Dumb. I kicked myself, metaphorically, for hours. Of course: it wasn’t the day or time that we usually saw my grandparents, and why would he be walking towards our house from a street at the other end of the park that he never goes to? I still do not call out people’s names in public unless I get an absolutely clear ID, not just on the face, but everything. Faces change from day to day along with hair and clothing. What if I remember a woman because of her facial hair and she goes and has it removed? At what point can I just declare myself autistic and demand that everybody around me wear name badges until I’ve seen them naked at least a few times? At that point, I figure we’ve bonded and I’m not likely to mix them up with someone else. Definitely, at shul, nametags for everybody, even regulars, would make my life much simpler. What was helpful at this thing last night, apart from hiding in the corner where nobody could see me and smiling continuously but meaninglessly, was that at the end of the evening, they called up some of the major donors by name. By name! They said the name of each could, and then two people would stand up and walk to the front and everybody claps for them. Okay, I hate that, deep down, I don’t really see why some lovely sleek couple gets clapped because they gave money and we will NEVER have people clap for us because we don’t have enough money to share in multiples of $18,000… but anyway. The autistic person in me was cheering because these are names that I hear all the time, and faces that I see all the time, and all of a sudden, for a brief instant, they came together. Of course I know who so-and-so is! He’s the guy who always nods to me as I’m arriving late for kiddush and he’s heading home. Of course that is so-and-so! And isn’t her sheitel gorgeous? But I have to say, it was a comfort to find a few people, maybe two or three faces, among the rabble at the dessert reception downstairs, who know me, really know me. Who are reasonably familiar – despite my not having seen them naked ever – and with whom I can bring out the regular smile, ask about stuff in their lives and not feel scared out of my wits that I was mistaking them for somebody else. Coincidentally, they were also, by and large, the people who actually took the sweet stuff for dessert… didn’t just pass it over for fruit and coffee. I may not have come away feeling popular, loveable or rich, but there’s nothing like chatting over chocolate to help me feel better about my abysmally poor social skills. Tuesday (Ted’s late day): Creamy corn & potato soup, pan-fried fish, plain rice and…? Tuesday (Ted’s late day): Beef Stew with home-baked Rosemary Focaccia. Oy, was it nice having the beef stew AND the bread pre-made. All I had to do was toss the bread in the oven to bake and the stew on the burner to come to a boil. YM passed this along to me. It is SO true... but I can't stop playing! Why??? Fun games? No thanks... I'll be playing FARMVILLE! So I totally neglected to mention that Naomi is reading. I didn’t want to push her, but I thought with a little encouragement, she could be doing a bit more, so I jumped in and bought the first series of Bob Books Beginning Readers. It turns out the books were “seconds” because the set is missing the first book – Book 1 of 12, “Mat.” Despite a strict “caveat emptor” policy on seconds, I was extremely happy that Rainbow apologized right away and credited my PayPal for the full value of the books. The set consists of a little cardboard box twelve little books, eight pages long, I think, with very simple line illustrations that each have just a dash of a single colour. Nothing flashy, nothing distracting. I am really coming to hate flashy educational materials: worksheets, readers, etc. The less on the page, the better, as far as I’m concerned. So, of course, due to the “seconds” thing – the cheapo lifestyle backfires sometimes – we had to skip Book 1, Mat, and started with Book 2, “Sam.” Naomi was immediately suspicious. “It’s not a real book – it’s stapled!” Because I have printed things for her in the past and called them books when, I guess in her mind, they were not truly books. So. NOBODY reads the books; they are only for her. I think she likes this rule. I had to grab one away from YM as he picked it up to read out loud last week. He is fascinated by Other People’s Stuff. Come to think of it, everybody here is fascinated by Other People’s Stuff. Argh. Don’t ask how I knew he was going to declaim it at the top of his lungs. He’s my kid, I know him well, and that’s what he would have done, given the chance. The books are pleasant enough, though the plots are a bit sluggish in the first books. I think she suspects they will get more lively as her abilities pick up, or perhaps I have said this to her, explicitly or implicitly. Anyway, I think she is very happy and satisfied so far. Last weekend, in Chapters, I noticed they had a small selection of these on the shelf, so I took the leap of faith that we will get through the remaining 9 books in Set 1 and picked up Bob Books Set 2-Advancing Beginners. Now all I have to do is make room in our breakneck homeschool schedule for… SCHOOL. On Wednesday, I actually took along an alef-bais worksheet to the drop-in gym so she could do it for 5 minutes before being allowed to run around and play. Which actually worked VERY well, since she was highly motivated to complete the page. Perhaps it didn’t motivate her to do the best job, however. Oh, yeah. I also just discovered today that Thingamababy, one of my favourite parenting blogs, reviewed the Bob Books almost 2 years ago. I wonder why I never noticed it until now…? So you can check out what he has to say – about Bob Books and a world of other baby-related and kid-related gadgets and gear, from videos to toys to nose suckers. Want to know what the halacha says about full-b0dy scanners in airports? Not much, apparently. Nevertheless, several rabbis were happy to weigh in. Read my CJN article here. My LIST of all the suppers! NEW LOGO January 26, 2011 – added for inclusion in the Menu Plan Monday linkup. 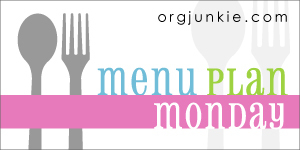 See it here, and click HERE to see my most recent Menu Plan Monday entry! List text last updated NOVEMBER 21, 2010!!! So. I started this food list in January 2010, after almost two years had passed since I last posted a summary of WHAT WE EAT around here. I have cut and pasted and skimmed through several years of suppers to cull a list of dishes organized by category. I've left out desserts, drinks and Shabbos food… it’s just too much work. There are some breads listed here, but for more on bread, see my Bread Blog! All of our family food is kosher. If I mention something like cheese on top of chili or spaghetti, assume those dishes contain no meat. We also eat fish, and luckily everybody enjoys it, most of the time. None of us has any significant allergies, so we eat dairy, wheat, etc., all that good old-fashioned stuff. I try to push our dietary envelope slightly beyond the ordinary. I’m currently trying to include one vegan meal a week ("Vegan Vursdays"). Sometimes, my family rebels and plops grated cheese or sour cream on top of a vegan meal – I don’t stop them. I’m doing it because I want to minimize our impact and dependence on animal products, and increase awareness… plus, I love a cooking challenge! creamy corn soup ( Imagine) from a package (Ted thought we should try it). Super-easy potato flakes and creamed-corn "fake soup." Tortillas – love the flatbreads! Garlic bread – not really a kind of bread, just regular bread toasted with garlic and butter on it! I'm thinking of taking out this section. For more on breads, visit my bread blog! Steak. We all love steak!! Pareve polenta w/wine & mushroom sauce? Roasted veg? Fish and chips – halibut deep-fried in beer batter – yum! Take the fish, fry it in a pan; easy! Fresh corn on the cob - in season, maybe with soup, a meal in itself! Polenta! It is amazing! The best food! Couscous; with raisins for North-African meatballs meal! Enjoy!!! I hope this list inspires somebody… it has certainly helped my own family pick and choose meals from time to time. This is just a rough outline. I plan to go back and fill in details as I decide, day by day. Meanwhile, here goes… great leap off the cliff called Getting it Together. Wednesday: Chili w/Cornbread (meat)… except I decided to be lazy and do the cornbread from a mix (PC Organic Corn MUFFIN mix; yeah, I guess I didn’t read that closely enough) and the mix was super-sweet and it tasted like Chili with Cake. Not a bad combo! You’ll notice I’m keeping it simple. Nothing fancy for now. And to make choosing food easier, I hope to go back, look through every Suppers post, and list all the supper dishes in a single post. I have done this before, but it was a Loooooong time ago. In case you’re curious, and missed it twice in the previous paragraph, here is a link to All the Suppers so far – last updated, as of almost exactly TWO years ago. I know I already raved the other day about this terrific kids’ art book (one of a series!) that I picked up a week ago for 99 cents at Value Village. I have to say… I have been reading two pages to the kids at a time, and this is a BRILLIANT book. Reading this is an education for ME along with the kids. I know this is pretty basic stuff, but, well, nobody ever told me where or how to look at the art before. I just kind of “skim” it, like “that’s nice,” or “I like the colours.” The colours are important, nice is important, but it’s also important to know that the poet’s head is on upside-down for a reason. Naomi Rivka is not QUITE as fascinated as I am, though she will talk about the paintings a bit, but the text is engaging, and brief, enough, that she listens nicely, understands, and is not overwhelmed. Also, the pages are organized so everything you need to know about a painting is organized on the facing page, so you are always looking at the art while you talk about it. That makes a big difference. I have great hope that the other books in this series, which I ordered online, will be equally wonderful. What a find! Okay, not technically true. But as my sister Sara often says (yes, my sisters can be as tedious as me sometimes), there’s more summer in September than there is in June. Yet we think of June as a summer month, and September as fall. Ditto with winter. We think of March as a spring month, but it really is mostly winter, more so than December. What have I just proven? I think I’ve just gone the other way and proven we have way more winter left to go. So anyway… if you zoom in a bit on the details, you’ll notice that ‘round about mid-January, we enter three weeks of minus-three’s in a row. That’s where we are right now. Then, on precisely February 9th, things start to turn around. On February 8, the average high is –3. On February 9th? Minus-two. After a week more of that, the temps go up by an average of ONE DEGREE every single week. Stuff like this, it keeps me going. In honour of another tease of an above-zero day, I got the kids out to Laughlin and Cedarvale for a lovely two-hour walk. Combination of playground fun and nature fun: my favourite. We admired seeds of all kinds, found sticks, poked puddles, with only one catastrophic slip-and-fall and head-bang on a particularly icy patch. Luckily, there was a big-boy friend GZ was trying to impress, so he didn’t cry too much. I know today was a tease. I know next week is supposed to be colder. I know we have to get through all those minus-threes and even (horrors!) minus-tens before we make it to the thaw. And I also know – as someone so kindly pointed out last year – that with rising temps, precipitation goes up. The new improved Downsview Park snow dump is still empty and it’s already late January. I know all that. I know warm weather isn’t always better weather. And I know that months can come in like lambs and go out like lions, or whatever they do. It is always darkest before the dawn, right? I don’t know what I’d do if I lived in Nunavut; I mean, I guess at some point, the weather must still turn around and start getting warmer, but “warmer” is all relative. What I live for is the above-zero days in February and March, though even those are a tease for real spring. Hey, maybe I’ll go order some petunias! Here’s what I’ve chosen for this year: Laura Bush Petunias. No, they’re not “bush petunias.” For whatever reason, they are named after the former president’s wife. 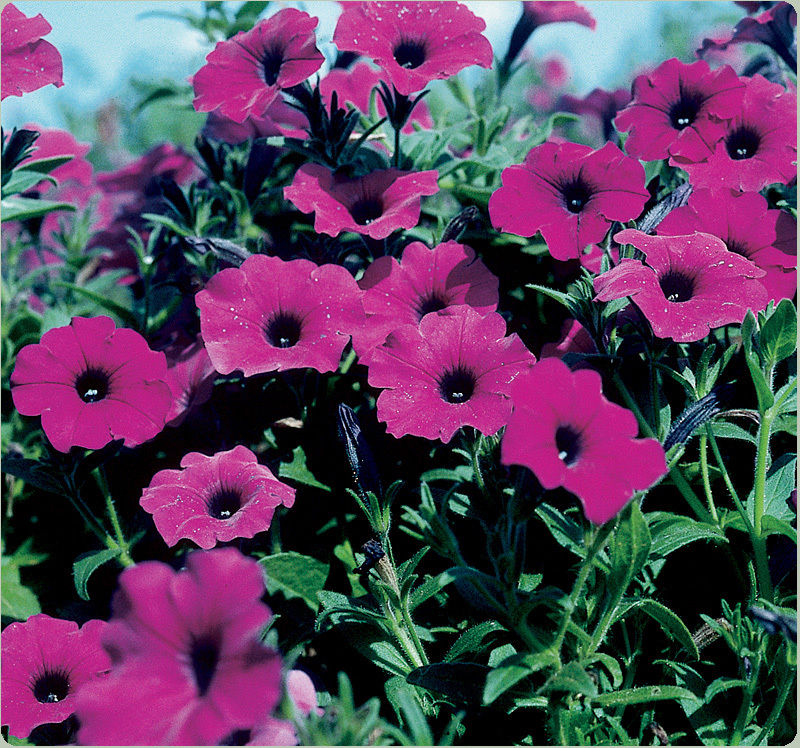 Petunias have been overbred commercially to get all kinds of desirable characteristics. They must be bushy (not as in President Bushy), they must fill in gaps, they must be small, or big, or double or whatever… but very few people are breeding SMELLY petunias, which is exactly what I want. Hence, the appeal of Laura Bush. Pretty cheap and easily available; better order soon so they’re ready to start later on next month!!! And no, it’s not the one you’d expect! Though there is unruly blond unmanageable hair, this is actually a photo of Big Boy-boy, about twelve years ago, showing off his magnificent bigness by climbing somewhere he wasn’t supposed to. And bad, inconsistent mama I am/was, did I stop him? No, of course… I just took a picture! Sigh. I remember having a bathtub that actually didn’t look like it had been specially imported from a warzone. It just makes you feel ALIVE, that’s what. Wooden front door open for the first time in weeks. Storm window open a crack to let in the nice (if cold) fresh air. The air outside SMELLS… good. Smells like spring. What a tease a day like this can be. … windowsill coleus, which are definitely outgrowing their drinking-glass homes! It’s 3:30 p.m. and I am betting the soil is still frozen solid-as-a-rock. Maybe later? Those coleus really need – to use a bureaucratic euphemism – to be re-homed. What a joy, what great hope, a warm day in midwinter really can be.